Watch this year's biggest movies with e-PLUS! 2012 is believed to be a "box-office" year, with a couple of movie houses experiencing jam-packed sreenings. To push "no more lines" and avoid "no more seats" situations, SM Cinema recently launched a card called e-PLUS—which stands for Entertainment, Privileges, Lifestyle, Upgrades and Surprises. What's is it? e-Plus is a reloadable card with 500 and 1,000-peso denominations. Once you have it, there's no need to fall in line! What are the perks? Each time you reload, you get free snacks. And each time you earn points, you get discount vouchers for parking and partner establishmenets. 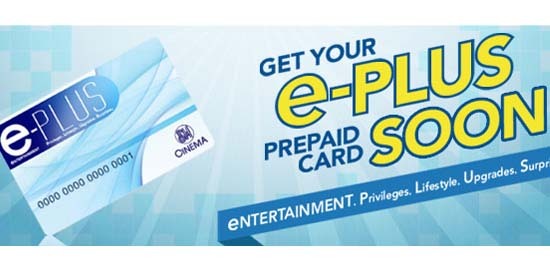 Plus, you're automatically entitled to 50% discount on select SM exclusive movies and other promos. How to join? Just fill up an application form at any e-PLUS booth or visit the SM Cinema website. The starter kit—which includes a premium item, an automatic pass to a movie, and a large popcorn and soda—costs 300 pesos. Call 470-2222 for more details!